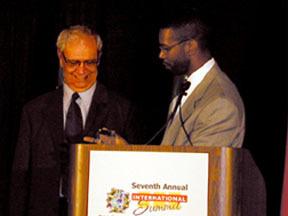 MOIAC PRESENTS EXPORTER OF THE YEAR AWARD TO MULTICOM, INC.
Home / News / News / MOIAC PRESENTS EXPORTER OF THE YEAR AWARD TO MULTICOM, INC.
ORLANDO, FL – May 2001 The Metro Orlando International Affairs Commission (MOIAC), and the international office of the Economic Development Commission (EDC) of Mid-Florida, Inc. awarded MULTICOM, INC. the 2001 Exporter of the Year. The award was presented today by EDC President and CEO Ray Gilley at MOIAC’s Seventh Annual International Summit held at the Orlando Expo Center. MULTICOM, INC. is a distributor of cable television and high-speed Internet access equipment that was founded in 1982 by Sherman G. Miller, MULTICOM’s President and CEO. MULTICOM has additional sales facilities in Miami, West Palm Beach and New Jersey. What is unique about MULTICOM is that they offer customers a creative and innovative one-stop shop for cable television and high-speed Internet access equipment by stocking over 3,000 different products including, fiber optic solutions and traffic signal equipment. Those products are today being shipped from the company’s distribution headquarters in Longwood to markets throughout North and Latin America. The company, through its Engineering Division provides system designs on the latest version of Auto CAD. Must have demonstrated a commitment to creative marketing initiatives that set the company apart from others in the industry and that have contributed to their unique international trade position. The Metro Orlando International Affairs Commission (MOIAC) was established in 1995 to focus on increasing international activities and trade within the four-county Orlando region. Supported by a board of volunteer community leaders, MOIAC brings under one umbrella the numerous international interests and initiatives of the community, including trade and investment, tourism, transportation, education, sports, arts, international organization, business trade associations and Sister City programs. Founded in 1977, the Economic Development Commission (EDC) of Mid-Florida Inc. serves the City of Orlando and Orange, Seminole, Lake and Osceola counties. It is the largest regional, not-for-profit, economic development organization in Florida. The mission of the EDC is to initiate business investment, lead the economic development efforts of the four-county region and market Orlando as the world’s premier business destination. Site Selection Magazine has recognized the EDC as one of the top economic development groups in the world.